If Thanksgiving dinner left you feeling unsatisfied, a) we're really sorry and b) you'll want to become besties with food blogger Annem Hobson. 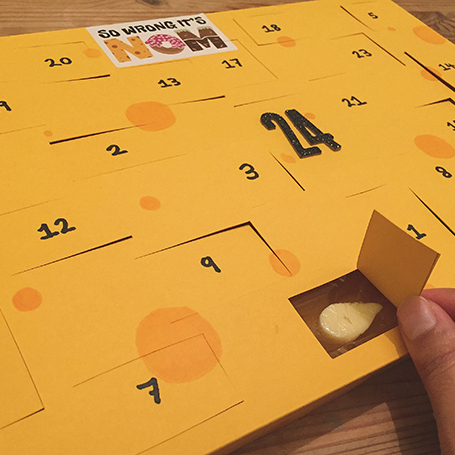 The 27-year-old London resident has created the first-ever cheese advent calendar to count down until Christmas. Featuring thick slices of holiday-shaped cheeses behind 24 different doors, Hobson's delicious invention was made using a chocolate advent calendar base, mini cookie cutters and a hand-drawn lid that resembles a slab of cheddar. While the calendar is simply a prototype, Hobson has created cheeseadventcalendar.com to turn her dairy dreams into a reality. Interested buyers can sign up for a listserv that will notify them of manufacturing updates. This is probably the only time we'd ever wish for a bleu Christmas. Danish, roquefort and gorgonzola, to be exact.